Staff and students looking at the class materials for the Power and Energy Engineering Practice School. 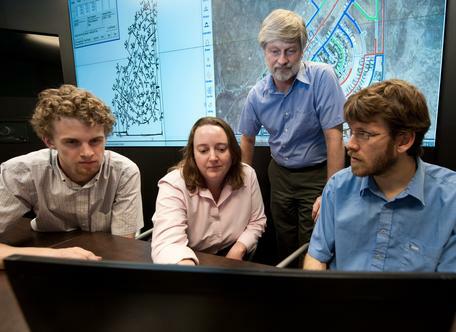 The practice schools is a collaborative effort between NREL and the Schools of Mines. Compiled by Bob Blodgett, Austin Community College. The list below provides pointers to the career information available from Professional Societies from across the geosciences. Almost all of these pages have information about what types of careers are available in particular disciplines, profiles of people who are doing those kinds of jobs, job placement opportunities. If you have a suggestion for an organization or resource to add to this list, please email John McDaris (jmcdaris@serc.carleton.edu). If you are looking for a good introduction to the geoscience workforce, start with the Career Cornerstone Center. Their site has a very accessible broad description of careers in the geosciences as well as average salaries in particular categories (note that the salary numbers are averages over all types of degrees, not just AA/AS). They provide comparisons to other disciplines. The American Association for the Advancement of Science (AAAS) Career Center can help to situate information about geoscience careers in the larger spectrum of science careers. AAAS programs provide information, training, and opportunities for collaboration among scientists, policy makers, professional organizations, non-profits, government, and industries regardless of geographic origin or career stage. As part of an investigation of the mechanisms of coastal change in the Carolinas, instrumented tripods were deployed on Diamond Shoals near Cape Hatteras, NC. These tripods recorded data quantifying the currents, waves, turbidity, temperature and salinity at several levels near the seafloor between January and April 2009. 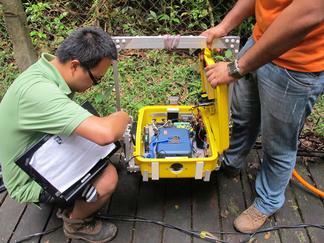 U.S. Geological Survey: Become a Geophysicist...A What? The Paleontological Research Institute: I Want to be a Paleontologist!